"Ben Frost (born 1980) is an Australian composer and producer. He is based in Reykjavík, Iceland. Frost composes minimalist, instrumental and experimental music, with influences ranging from classical minimalism to punk rock and black metal. 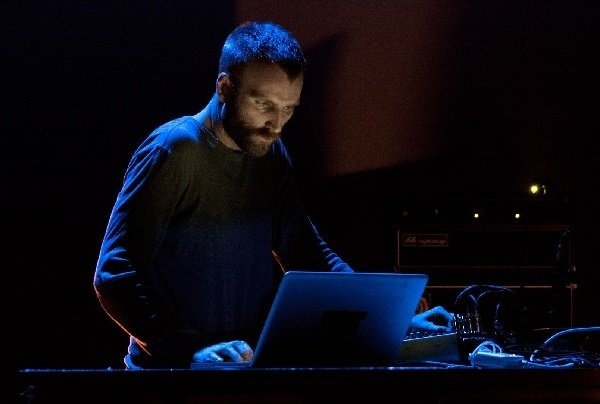 His albums include: Steel Wound (2003), School of Emotional Engineering (as part of the band School of Emotional Engineering) (2004), Theory of Machines (2007), By The Throat (2009), Sólaris (with Daníel Bjarnason) (2011), and Aurora (2014). He has collaborated with contemporary dance companies Chunky Move, the Icelandic Dance Company and the British choreographer Wayne McGregor. He composed the music for Wayne McGregor's 2010 work FAR. Frost co-composed with Daníel Bjarnason, Music for Solaris, which was inspired by both Stanislaw Lem's original novel and the 1972 Tarkovsky film Solaris. Commissioned by Unsound Festival, it was performed by Frost, Bjarnason and Sinfonietta Cracovia. He composed the music for the films, Sleeping Beauty, the Icelandic drama The Deep and the 2015 British television series Fortitude. In 2012 he travelled to the Democratic Republic of Congo with Richard Mosse, along with Trevor Tweeten and John Holten, to score the sound for Mosse's artwork The Enclave. Track 10 is a Japan-only bonus track. All proceeds from sales of this album go directly to Amnesty International. Includes photo book and poster, both in .pdf format. Performed by Ben Frost & Daníel Bjarnason with Sinfonietta Cracovia. Sinfonietta Cracovia: Maciej Lulek, Małgorzata Szuba-Kmiecik, Marcin Kmiecik, Aleksandra Honcel, Katarzyna Blajda, Marcin Hałat, Izabela Szlachta-Dowgiałło, Piotr Marciak, Robert Milewski, Danuta Brandys, Justyna Duda-Krane, Danuta Augustyn, Lilianna Adamska, Stanisław Słowiński, Ewa Szczepańska-Chwast, Aneta Dumanowska, Ryszard Sneka, Rafał Daszkiewicz, Żanna Laszkiewicz, Jan Tomala, Tomasz Wyroba, Alina Dorożyńska, Marcin Mączyński, Jan Kalinowski, Beata Urbanek-Kalinowska, Piotr Bylica, Michał Skiba, Grzegorz Klimczak, Jakub Strycharz, Ryszard Haba, Tomasz Sobaniec. Ben Frost has announced details of his fifth studio album, The Centre Cannot Hold, out on 29 September 2017. The Centre Cannot Hold was recorded over ten days by Steve Albini in Chicago. The music exists not in space, but in a space; it is a document of an event, of a room, and of the composer within it. It is music that is not fully controlled and appears to be anxiously, often violently competing against its creator. An exercise in limitation and chromatic saturation, The Centre Cannot Hold is an attempt at transcribing a spectrum of glowing ultramarine into sound. Ben Frost released Threshold Of Faith, a seven-track 12” and digital EP, last month. Pitchfork describe the track title track as “moving from heroic vistas into a garbled, snow-blinded melee. Distant choral pads, a glistening upper-register sheen, submerged piano, and groaning harmonies all stack up into a geologic crescendo that extends into infinity.” while The 405 describe the EP as “scorching and beautiful”. This recording was produced almost in its entirety within the walls of Greenhouse Studios in Reykjavík, Iceland. Geenhouse is managed by Mio Þórisson. "Killshot", "Through The Glass Of The Roof" and "Through The Roof Of Your Mouth" contain raw material from "The Will To Burn" and "The Lycanthrope" from the album "Son Of Sulphur" by Crowpath. Used with permission. This recording contains various recordings of orcas off the coast of Henningsvaer, Norway. Valgeir Sigurðsson, Sam Amidon and Nico Muhly appear courtesy of Bedroom Community. Lawrence English appears courtesy of Room40. Ben Frost uses software by Ableton and native instruments. "By The Throat" was photographed at Huldaheims, Dalvik, Iceland. Influence upon this recording by Sruli Recht, Valgeir Sigurðsson, Lawrence English, Nico Muhly and Paul Corley cannot be overstated. Particular gratitude is directed also to my family, Tim Hecker, Daniel Rejmer, Sam Amidon, Laurent Briet, Andrew Kotatko, Rebeca Méndez + Adam Eeuwens, RVK!, Amiina, Hildur Guðnadóttir, Mio, Paul Evans, Sigga Sunna and Danny "Liner-Notes" Johnson. Issued in a gatefold cardboard sleeve including a 10 pages booklet.